BMW M3 GT2 hotlap at ... anywhere! I suggest anything that hasnt been used in a while: Longstone, Brno, Pudsey or even Sonoma itself! Yes I don't know why there is so few events at the moment, I vote for Sonoma NASCAR for the M3. So out of all suggestions above, we've already had it at Longstone, Watkins Glen, Sonoma and Silverstone in regular events already, that including Quick Races and multiple layouts for each. We never had it at Brno though and I feel like that could be a really good combination! It's always worth to put the cars on variety of tracks from historical point of view, because that helps us collecting data about them for the future, including Skillquant. 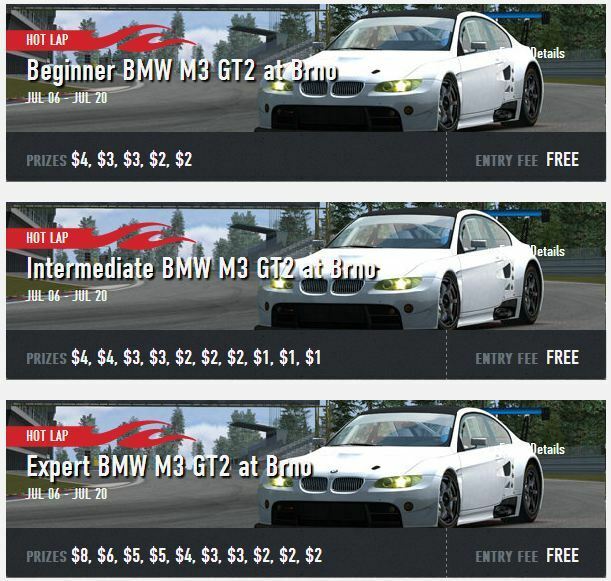 I will prepare 3 Hot Laps with BMW M3 GT2 at Brno, with Beginner, Intermediate and Expert difficulty class. Expert in this case will replace Advanced, specially for Risto and all those who always wanted to try an open setup with this great car. On top of that, today's GT2 Quick Race will be put on Brno as well. To answer your question Andrea, yes it's faster. That's how it should be done all the time Cossacco - Beginner, Inter - current Inter and Advance combined (paying out 20 places instead of 10) and Expert, on all events! Will be interesting to have a go at the open setup. // Coss wrote it will be at Brno...then make plz an event Maserati MC12 GT1 at Sonoma Nascar, I don´t remember any event with this car and IMO it doesn´t deserve to be parked in garage and also this car is the only one with GT1 specs in game currently. Thx avsome combo car and track . Open setup is fun , but it scares me a bit becouse fast drivers will be ewen faster now !